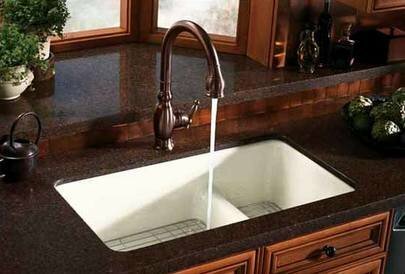 If it’s time for a new kitchen sink, first consider your countertops. If they’re laminate, you’ll need a top mount or drop-in sink. You could consider an undermount sink with stone or integrate it seamlessly with solid-surface countertops. Stainless steel sinks are popular and durable, and coordinate well if you have stainless appliances. Cast-iron, porcelain-glazed in a variety of colors, is a good bet for timeless designs like the apron sink. If you’ve got the budget, copper, zinc or soapstone will make your kitchen sink a conversation piece. If you have the room, consider a three-bowl model, integrated drainboard or flexible bowl configurations for the way you work. Be sure to order your sink with the right holes for the faucet and accessories–strainers, cutting boards, soap dispensers—that’ll make it a more useful tool!